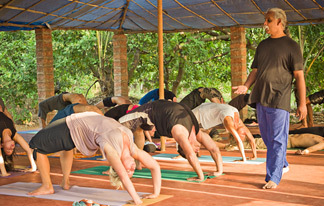 Shri Kali Ashram teaches that Yoga is a science, not a sport or a game. Yoga by its nature never teaches competition. Competition means that one is comparing and contrasting to external measures. Yoga instills integration, enrichment and incomparable inner strength. With these qualities, yogis master life. Mastery gives fulfillment and fulfillment stops one from dependence on the external. Since yoga is such an important practice, Shri Kali Ashram welcomes the idea of Yoga Alliance® as an external body to maintain the quality of teaching and legality for the benefit and advantage of students. We believe in imparting quality teaching and therefore see virtue in creating standards in the performance and teaching of yoga: āsanas (postures), prāṇāyāma (breath control), dhyāna (meditation), yogic healing (Āyurveda and Siddha), and yogic philosophy. 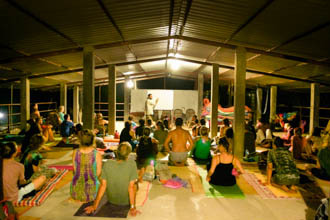 Shri Kali Ashram is registered with Yoga Alliance® and certified to give 500, 300 and 200 hour certifications. Bhagavan Shanmukha is registered with Yoga Alliance as an E-RYT 500™ and our other teachers are registered as E-RYT 500™s, E-RYT 200™s, RYT 500™s and RYT 200™s. At Shri Kali, we promote quality in teaching and time spent. We offer personalized coaching by our experienced teachers to allow students to achieve well-balanced learning and also have the benefits of a yoga retreat and an inner holiday. At Shri Kali, we believe that only if one is relaxed can one learn. We have structured our long-term courses to cater to individual timeframes, as we realize that it is difficult for people to get away and study. You can join the long-term courses at any time. For people aspiring to be tantric teachers or adopt the tantric lifestyle, we recommend a minimum of six months intensive study. Our system teaches mastery of the physical aspects of tantra and yoga in one year, including the sexual aspects. Tantra is a complex and in-depth science. You will find it worth your while, both personally and professionally, to take the time to study it thoroughly. It is important that those who aspire to be teachers first master the science of yoga so that they can share their knowledge with love. Our goal is to produce skilled and knowledgeable teachers who can share the science of yoga and tantra, not only the practice. If you already have a Yoga Alliance® 200hr Registered Yoga Teacher™ certification, please apply for 300 hours training to obtain a Yoga Alliance® 300 hour Registered Yoga Teacher™ qualification with Shri Kali Ashram. *Our teacher certification classes are held during the first three weeks of each month (1st-21st). The fourth week of the month (22nd-28th) you are welcome to stay on to deepen your practice, study, and integrate at your weekly rate. There will be only one long morning class. 8 or 10 weeks intensive study as per your schedule. 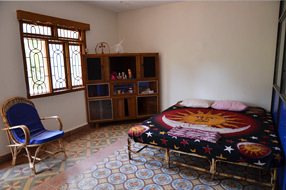 All ashram lodging includes a spacious private room with private bathroom or semi-private bathroom. Our residential buildings have large balconies, tree-shaded gardens, easy access to the beach and free high-speed wi-fi Internet. 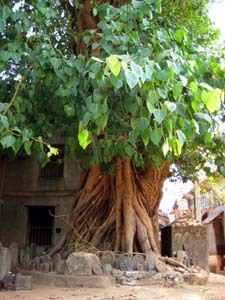 The ashram's food and lodging is non-for-profit. If you wish to use the Internet, please bring a laptop or tablet with universal powerpoint. Sheets and yoga mats are supplied; please bring a blanket for chilly nights in winter. We recommend you purchase our books from Amazon.com Shri Kali Publications. These books are also available for purchase in photocopy form at the ashram. We also lend books on all subjects. Your course fee includes all course materials. Shri Kali Ashram is family friendly. If you are travelling with children, we can arrange for a nanny during classes. The cost of our full-time (8 hour) nanny service is $110 US per month. Children under 5 years old eat and board for free. Children 6-12 years old are half the amount of food and board as an adult. If you wish to convert from $US to € at the current daily rate, please use this converter XE Currency Converter. Please contact us by email for more information.